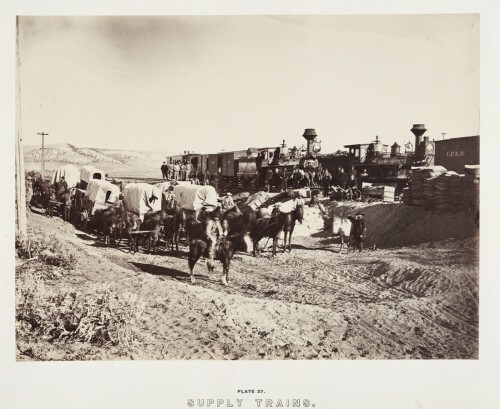 During the construction of the railroad, wagon trains went ahead of each construction site to deliver the needed materials to build the tracks. As the construction workers progressed forward they found construction materials waiting, which helped the process run smoothly. Above, emigrant wagon trains move along the same trail used by Jack Casement’s construction train. For the pioneers, using the same right-of-way made the trip easier. Learn more about the construction trains that helped build the Transcontinental Road.